Online magazine, Esquiremag.ph, that conveys a pace that meets the recent time's steady stream of national concerns, political issues, entertainment and fashion, recently shared an article about what the author thought as the Philippines' greatest statesmen who could have led the country. The article was initially published in the August 2014 issue of Esquire Magazine with the title ""The Greatest Presidents We Never Had." and just recently, Esquire reposted it on their Facebook page. With that being said, from the time they originally made the article and up until now, the author may think likely the same, that these five men could have been great leaders if only given the chance. According to the author, these five men were comprised of an unyielding nationalist, a brash overachiever, caustic commentator, pedigreed attorney and raffish charmer. "An unyielding nationalist who howled by his unminding lonesome; a brash overachiever who aged into world-renowned eminence; a caustic commentator who remained a public intellectual despite his government sinecure; a pedigreed attorney who knew the difference between law and justice and fought for the latter; and a raffish charmer who surrendered liberty then life for the sake of the people’s freedom. We present singular wisdom from the five great presidents we never had. Don Claro served as a Congressman, Supreme Court Justice, president of the 1935 Constitutional Convention, and a long-time member of the Senate. He also helped pave the way for Magsaysay’s defection from the Liberal Party to run for President under the Nacionalista fold. 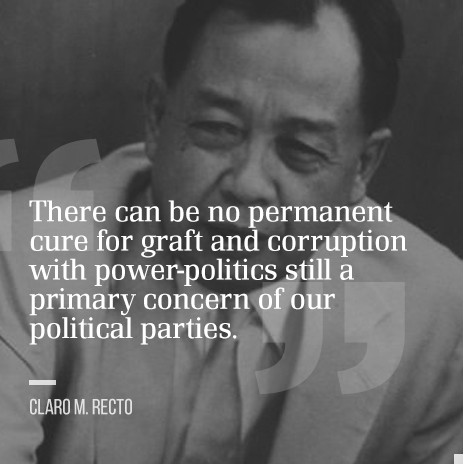 Recto, a staunch nationalist who did not agree with the administration's close ties to the United States, eventually mounted an unsuccessful run for the Presidency in 1957. In May 1954, the 39-year old Undersecretary for Foreign Affairs prepared to face life as a foreign exile, albeit as an ambassador, having earned the displeasure of the President he served, Ramon Magsaysay. 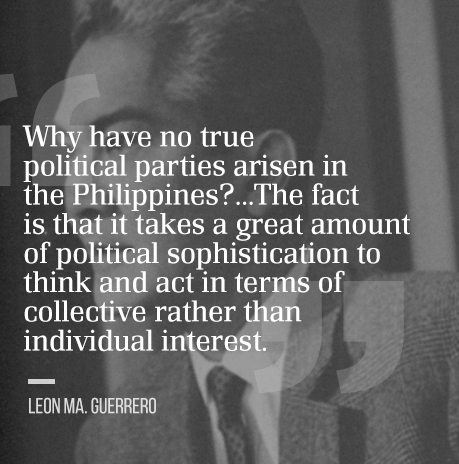 Guerrero had caused a stir by declaring that the Philippine government was embracing a nationalist foreign policy, which did not sit well with the West. A duly elected Senator of nationalist bent, Diokno’s was one of several promising political careers cut short because of the Philippine establishment’s too-close relationship with the Cold War-era United States. Recognized as the best lawyer of his generation, Diokno was eventually appointed to the Supreme Court but died shortly after. 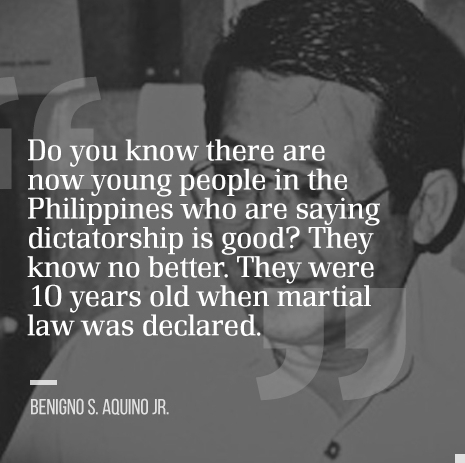 At the age of 21, Aquino was already a special adviser to President Magsaysay on the problem of the Communists. Cursed with a family name that was toxic in Philippine politics, his deceased father had been tagged as a collaborator during the Japanese occupation. The younger Aquino, however, would go on to redeem his family’s legacy. When martial law was declared, Aquino was at his peak—a credible threat to the sustained rule of Marcos—but ended up in solitary confinement at an army camp in Nueva Ecija."